Nursing Programs directors gathered to learn about Lehman College’s Hybrid Program. Moderator, Brenda Acevedo from Atenas College and the audience listening to Prof. Natasha Nurse and Prof. Myriam Cadet from Lehman College (CUNY) during the event at UNE. A Nursing Programs Event, was also celebrated concurrent to the HETS Board meeting on Friday, June 16, 2015. 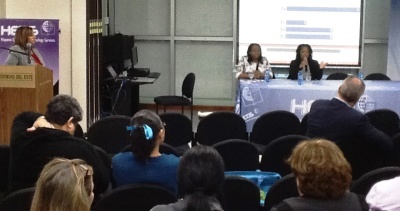 This event was directed to all member institutions with Nursing Programs in its curriculum. 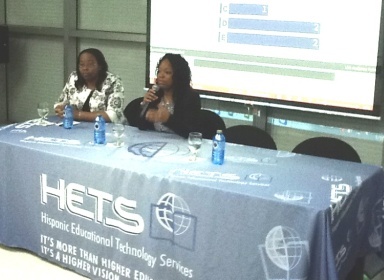 Directors and other principals of Nursing Programs at HETS member institutions took advantage of this event exclusively for them. Moderated by Brenda Hernández-Acevedo, RN, MSN, VP of Innovation and Institutional Quality, Atenas College; the purpose of this event was to learn about Best Practices in designing a hybrid Nursing Program. Prof. Natasha Nurse, RN, CNS, Lecturer, Nursing Department; and Prof. Myriam Jean Cadet APRN, MSN, FNP-C, Substitute lecturer, Nursing Department at Lehman College presented the pitfalls to avoid, and how this process can be extrapolated to other LMS among others interesting initiatives presented based on thei r experience. The event was transmitted live the day of the event through Universidad del Este‘s U-Stream Channel and also participants that were not able to attend had the opportunity to participate online. The session was also recorded and it is available to watch it at the HETS You Tube Channel under the title Nursing Programs event. HETS would like to thank the IT department of the Universidad del Este, AGMUS and its team for the live streaming the day of the event and its recording.